Berryat described the first reported case of lens dislocation in 1749, and Stellwag subsequently coined the term ectopia lentis in 1856 (describing a patient with congenital lens dislocation). Ectopia lentis. Dislocated traumatic lens (cataract). Ectopia lentis. Dislocated lens into the vitreous secondary to trauma. Disruption or dysfunction of the zonular fibers of the lens, regardless of cause (trauma or heritable condition), is the underlying pathophysiology of ectopia lentis. The degree of zonular impairment determines the degree of lens displacement. Ectopia lentis is a rare condition. Incidence in the general population is unknown. 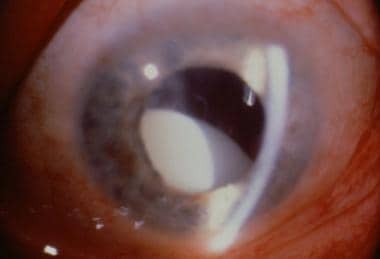 The most common cause of ectopia lentis is trauma, which accounts for nearly one half of all cases of lens dislocation. Ectopia lentis may cause marked visual disturbance, which varies with the degree of lens displacement and the underlying etiologic abnormality. Males appear more prone to ocular trauma than females; therefore, a male preponderance has been reported. Male and female frequency varies with the etiology of the lens displacement. Ectopia lentis can occur at any age. It may be present at birth, or it may manifest late in life. Depending on the degree of lens dislocation, the age of onset, and its associated secondary complications, most patients do well. Those patients who have trauma-associated ectopia lentis may have other more life-threatening complications (depending on the severity of the trauma). Patients with heritable conditions associated with ectopia lentis may have other systemic complications. Patients with ectopia lentis associated with a heritable condition need to be educated on the importance of following up with a primary care physician to rule out life-threatening disorders. Safety glasses are advocated when risk of eye injury is possible. Jarrett WH II. Dislocation of the lens. A study of 166 hospitalized cases. Arch Ophthalmol. 1967 Sep. 78(3):289-96. [Medline]. Nirankari MS, Chaddah MR. Displaced lens. Am J Ophthalmol. 1967 Jun. 63(6):1719-23. [Medline]. Nelson LB, Maumenee IH. Ectopia lentis. Surv Ophthalmol. 1982 Nov-Dec. 27(3):143-60. [Medline]. Clark CC. Ectopia lentis: a pathologic and clinical study. Arch Ophthalmol. 1939. 21:124-153. Albert DM, Jakobiec FA. Pathology of the lens. Principles and Practice of Ophthalmology. 2000. 2225-2239. 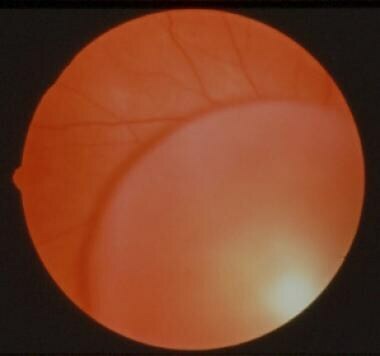 Nelson L. Ectopia lentis in childhood. J Pediatr Ophthalmol Strabismus. 2008 Jan-Feb. 45(1):12. [Medline]. Omulecki W, Wilczynski M, Gerkowicz M. Management of bilateral ectopia lentis et pupillae syndrome. Ophthalmic Surg Lasers Imaging. 2006 Jan-Feb. 37(1):68-71. [Medline]. Parrish RK II. Anatomy, physiology, and pathology of the crystalline lens. Bascom Palmer Eye Institute's Atlas of Ophthalmology. 1999. 241. Duane T. Cataracts and systemic disease. Duane's Clinical Ophthalmology. 1999. 5: 13-14. Ganesh A, Smith C, Chan W, et al. Immunohistochemical evaluation of conjunctival fibrillin-1 in Marfan syndrome. Arch Ophthalmol. 2006 Feb. 124(2):205-9. [Medline]. Wentzloff JN, Kaldawy RM, Chen TC. Weill-Marchesani syndrome. J Pediatr Ophthalmol Strabismus. 2006 May-Jun. 43(3):192. [Medline]. Konradsen T, Kugelberg M, Zetterström C. Visual outcomes and complications in surgery for ectopia lentis in children. J Cataract Refract Surg. 2007 May. 33(5):819-24. [Medline]. Ectopia lentis. Supertemporal dislocation of a lens in the right eye of a patient with Marfan syndrome. Note the attached zonular fibers. Ectopia lentis. Microspherophakia and spontaneous inferior dislocation of a lens in a patient with Weil-Marchesani syndrome. The authors and editors of Medscape Reference gratefully acknowledge the contributions of previous coauthor, David E Eifrig, MD, to the development and writing of this article.